THEUMPSCHOOL.COM presents proprietary online training and education in rules and mechanics for baseball umpires. 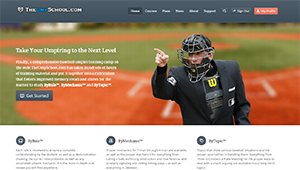 THEUMPSCHOOL.COM is a 501(c) (3) Non-Profit Organization dedicated to improving umpire training. We have compiled hundreds of hours of umpire training video content to provide exceptional instructional material to our students. This is the only training of its kind anywhere, and we use our proprietary training method to help you retain information and implant visual recognition better and faster to lessen the time it takes to be a better umpire. Our proprietary learning method leverages multiple types of content that are delivered in such a manner as to improve memory recall and speed up the learning process for umpires. This approach to learning is so unique and revolutionary that it is patented – there is nothing like it anywhere. CASRTS™ is the first-of-its-kind sports official specific training curriculum specifically designed to significantly reduce an umpire’s learning curve. In testing, we have seen a three to five-fold decrease in the amount of time it takes to learn play recognition versus umpires that learn the old-fashioned way. This means that we are cutting your learning curve down to one-third to one-fifth of what it would normally be! Students and UICs can track their progress to see which courses have been taken, as well as test scores. Areas that need extra work can be repeated as often as desired. TheUmpSchool.com is also a proprietary learning management system that students and UICs can use to track progress, and to test knowledge and retention of the subject matter. The lessons can be taken in any order, or they can be taken in the suggested order for beginners (recommended for 1st to 3rd year umpires). Each student has a profile that can be personalizde and provides information on their level, skill and experience. When each student logs in, they are taken to their profile. They are able to personalize it and add their photo, experience and a short description of their goals and/or experience.